A group of students in fashion design classes at a United Kingdom school recently exhibited designs to a sold out audience in a fashion show displaying trash turned into treasured apparel this month. The students of Sarum Academy used trash and scrap fabrics to create the apparel as part of a project to bring awareness to the importance of reducing, reusing, and recycling among teens. The fashion show was a success as students in their 10th year at the school presented their clothing lines to the packed audience. The program was between the Wiltshire Wildlife Trust and the Wiltshire Council in Salisbury. The fashion design students used everything from cracker packages to old, worn out clothes to repurpose their materials into a viable ensemble. The project taught the teens that trash is only trash if you don’t use it for anything else, a concept that never occurred to many of the students. Recycled clothing is one of the most economical and environmentally friendly ways to create new fashion designs according to some industry experts. It doesn’t have to be derived of new materials to be fashionable or in-style, as one student of the fashion design project pointed out. As the students in this project discovered, just about any material can be used to design clothing. Other fashion design schools around the world assign their students similar projects to encourage creativity in their art, as well. The method is known as “up cycling” and is a method of fashion design being adopted by more and more young people around the world who seem to be more environmentally aware than their predecessors in the industry. 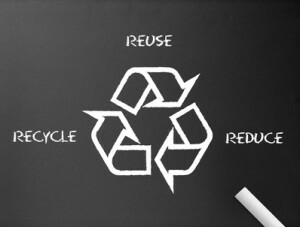 Recycling fashions is a trend gaining momentum the world over. Sarum Academy is a Church of England Academy that was formed through relationship turned partnership between the Church of England, the Wiltshire Council, Bath Spa University, and Bryanston School. Fashion design student learn the value of turning trash into treasure at a UK school….